Almuñécar is on the Costa Tropical and by road is 75 kilometers from Málaga, 80 kilometers from Granada, and 129 kilometers from Almeria. It is easy to make you way to and from Almuñécar and you have several transportation options. There are frequent buses directly between Almuñécar and Granada, and some from the Airport as well. There are more options if you can take a bus from the airport to the main bus station in Granada.The price is roughly about 8 euros each way, depending on the class of bus and route you select. Book your bus tickets now! If you miss the Alsa bus and need to make a connection through the central bus station, this is the most common bus service used from Granada Airport. It is operated by a company known as Autocares José González. From Granada Airport, the buses depart after each arrival flight, from outside the arrivals hall. The price for the journey is 3 Euros, and bus tickets are available for purchase from the bus driver. Inquiries relating to the bus service can be made at the information desk found within the terminal, where there is a sign that lists the schedules of the bus services. Keep in mind that bus schedules are sometimes changed due to flight times. It is about 75-90 minutes by public bus from Almuñécar To Granada bus terminal. Please allow time to travel within the city to your destination. You would depart Almuñécar from the central bus station. You may purchase tickets within the station or you can book now in advance. Click here for timetables and prices for buses. The bus to Granada takes you to the Granada Central bus station. To get to the center of Granada take bus 3 or 33, which will take you to the Cathedral. You may also take the LAC, SN1 bus, which goes directly from the bus station to the Cathedral on the Gran Vía: it is not necessary to change buses. 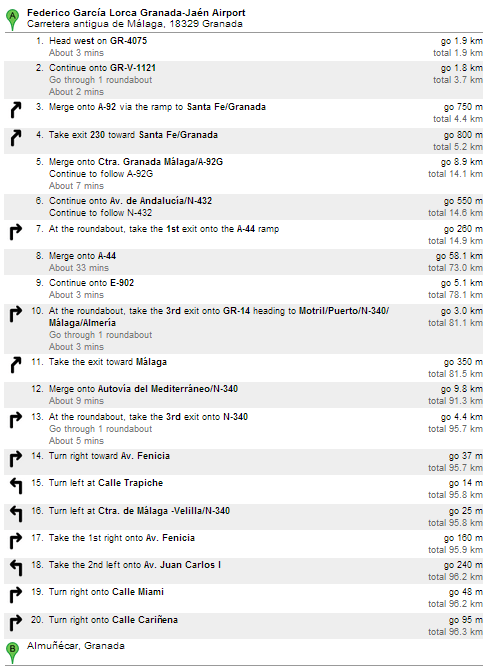 More info on Granada Local Buses. The timetables below are examples at the time of writing. Please check the website for current route and pricing information. You may buy your bus tickets online now! There are several options from shared shuttle to private car services offered through Shuttle Direct. Click here to find the best deals on your transportation from Granada. There are many car hire options with very reasonable prices at the Granada Airport. 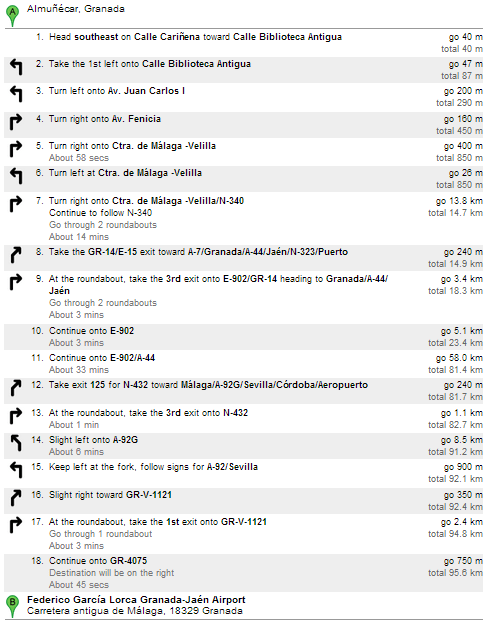 This option will be about 90 minutes of driving time from Granada Airport to Almuñecar using the autopista (motorway). Of course it is about the same amount of time to go from Almuñecar to Granada Airport. If you are traveling to / from the City Center it is about a 1 hour drive. Click here for Spain car hire tips and tricks! If you have more time and you don’t like motorways there is an incredibly picturesque road from Almuñecar to Granada. Follow the signs from the center of Almuñecar to Otivar or Jete. If you go this way it will take about 90 minutes. There are lots of tight bends, the views are spectacular. Here is some helpful Granada Airport Info. For stays of more than 24 hours in Granada it is best to go to Severo Ochoa Car park. 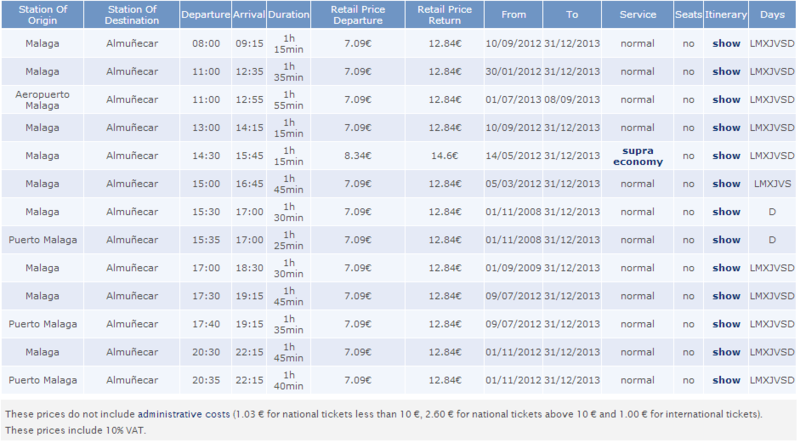 Explore Spain or Europe via train, check Rail Europe deals.